The meta title of your page has a length of 28 characters. Most search engines will truncate meta titles to 70 characters. The meta description tag is missing from your page. You should include this tag in order to provide a brief description of your page which can be used by search engines. Well-written and inviting meta descriptions may also help click-through rates to your site in search engine results. Note that in HTML the <meta> tag has no end tag but in XHTML this tag must be properly closed. Meta description can have any length but a good practice is to keep this under 160 characters (search engines generally truncate snippets longer than this value). First of all, you must make sure that your page is using the title and meta-description tags. Second, you must adjust these tags content in order to include some of the primary keywords displayed above. Congratulations! The size of your webpage's HTML is 19.62 Kb and is under the average webpage's HTML size of 33 Kb. Faster loading websites result in a better user experience, higher conversion rates, and generally better search engine rankings. Congratulations! Your webpage is successfully compressed using gzip compression on your code. Your HTML is compressed from 118.21 Kb to 19.62 Kb (83% size savings). This helps ensure a faster loading webpage and improved user experience. Your website loading time is around 4.66 seconds and this is under the average loading speed which is 5 seconds. 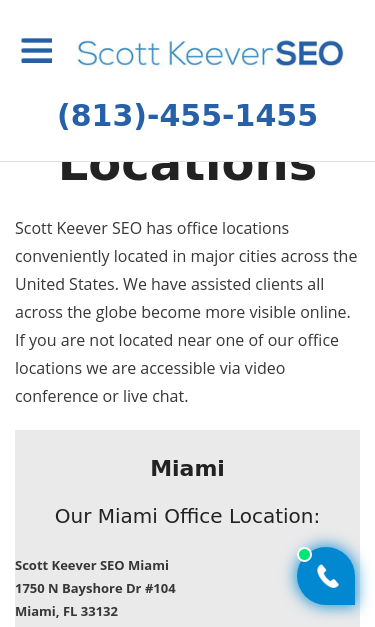 https://scottkeeverseo.com/locations and https://www.scottkeeverseo.com/locations resolve to the same URL. Your webpage uses the noindex meta tag. This means that your webpage will be read but not indexed by search engines. Your webpage is using the canonical link tag. This tag specifies that the URL: https://scottkeeverseo.com/locations is preferred to be used in search results. Please ensure that this specification is correct, as canonical tags are often hard-coded and may not always reflect the latest changes in a site's URL structure.